After committing myself to walking 22 miles for charity later on this year, I decided that I should see what the route was going to be like. I know that I will be walking along the Jurassic coast path in Dorset between Weymouth and Purbeck, but I didn’t know much about the route. 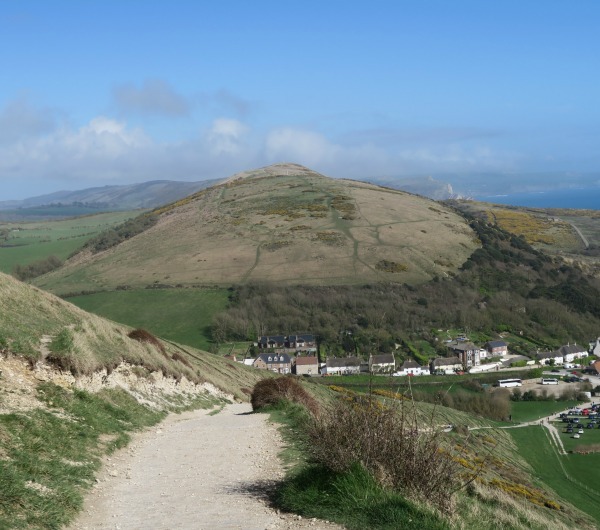 When we went to Lulworth Cove last year on Hubby’s birthday, we found ourselves in the midst of all the walkers so I had a vague recollection of seeing them walk up the steep inclines, something I’m not sure I’m ready for. We decided to venture down to Lulworth Cove again this weekend, taking Lola for a good walk and also to see how steep the inclines are along this stretch of the South West coast path. Lulworth Cove is a lovely place to visit in any weather but when the sun is out, the views are truly spectacular. 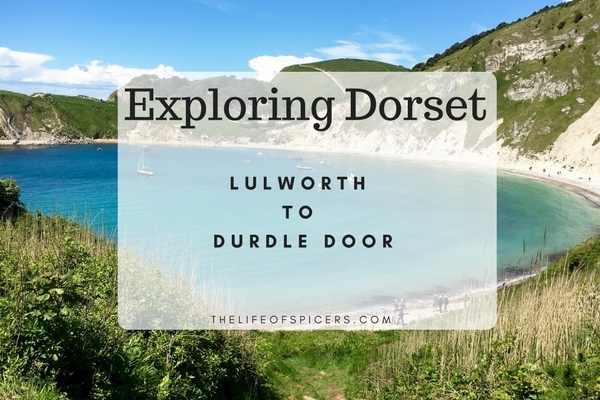 You can easily spend a whole day at Lulworth, there is so much to do from enjoying a drink in the pub to spending time on the beach and visiting the fresh fish shop on the way home. There is ample parking at both Lulworth Cove and Durdle Door, and the prices are the same. If you enjoy views from the car then I would recommend parking at Durdle Door where the car park sits on top of the cliff. However I prefer parking at Lulworth Cove as Lulworth beach is easier to access than Man of War beach at Durdle Door. Can you swim in Lulworth Cove? Whilst the beach is shingle and large pebble making it difficult to walk on at times, the cove is perfectly fins for swimming in. If you chose to you could swim across to Man Of War beach at Durdle Door, but it could take up to an hour. Personally I prefer to walk it. 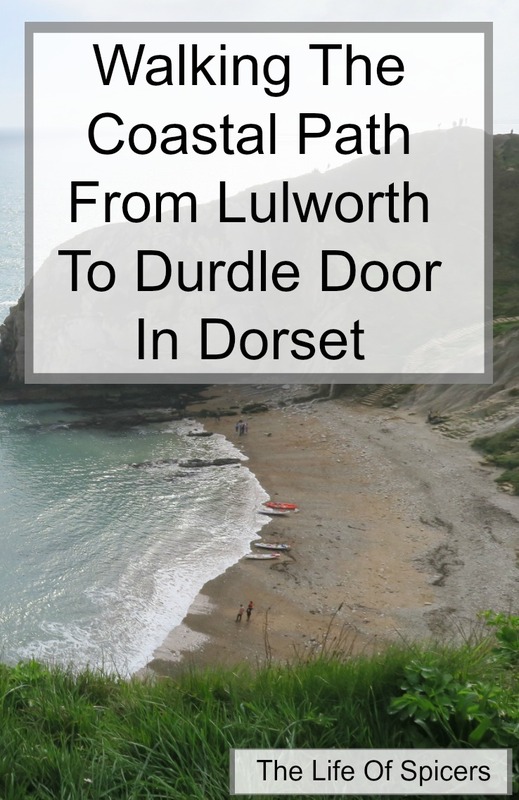 I discovered the walk from Lulworth Cove to Durdle Door was shorter than I realised. Abby loves Durdle Door as she always thinks she’ll be able to find some fossils, so off we went. The path leading out of Lulworth Cove towards Durdle Door is quite steep and I began to realise just how unfit I actually am. We were very lucky with the weather as at home it was raining, but we were being treated with glorious sunshine which was providing some amazing views. At the top of the incline the terrain levelled out a little, however there were tree roots poking out of the ground. I was starting to wonder what I have signed myself up to. Still it’s for a good cause, and my walking boots and poles were a good decision. We were soon at the descent for Durdle Door. It was a lot closer to Lulworth Cove than I realised, and I wished we had taken the time to do this walk more in the past. The loose stones on the ground did make the walking slightly treacherous on the steep decline, and I was thinking it was almost safer to walk uphill than down at one point. 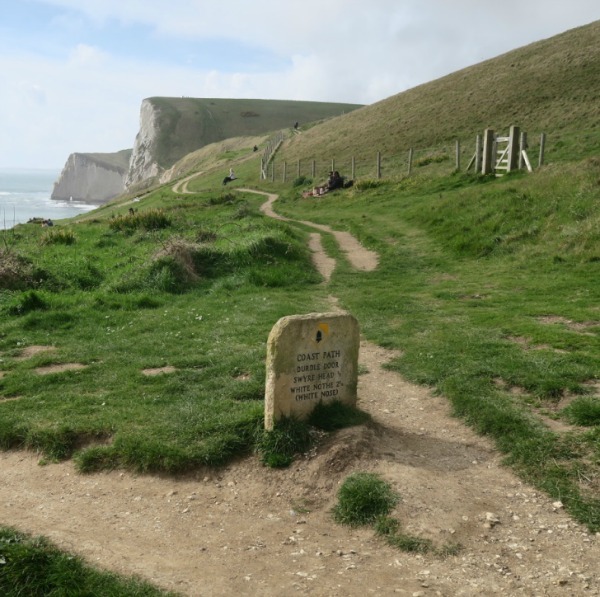 Logic told me that on the day I would be walking from Durdle Door towards Lulworth Cove rather than the direction we were currently taking, and I could see where I thought the walking path may take us, although I’m not 100% sure what will happen on the day until we get there. The Durdle Door steps down to the cove have eroded quite a lot and we had to be very careful walking down, thankfully this won’t be part of my trek. We were treated to an almost empty cove area which was lovely as Lola had a good run and we were watching the waves crash over the rocks. Making our way back up the Jurassic Coast path was quite tough on my legs, my calves were burning, and I found my feet walking on a slant as I was trying to stay straight with the ground. This taught me that I am going to need to invest in walking boots with ankle support very soon so I can wear them in before the big day. As we reached the car again, we discovered that the walk between Lulworth Cove and Durdle Door and back again had taken us just over an hour, we had walked 6,000 steps and just over 70 inclines according to our Fitbit watches. This is great but my legs and knees were sore at the end so I can tell I am going to have to increase my fitness a lot to be able to complete my 22 mile trek comfortably.